After watching Blow Out and seeing how passionate Jonathan was about his product, he sold me. Anyone who is that determined to make the best product on the market, obviously will do whatever it takes to make it happen. After seeing how much the product was, I cringed at the fact that a bottle of shampoo would be that much. I later, literally dragged myself to Sephora to purchase this shampoo/conditioner after knowing that I was willing to take a risk that could eventually end up in my closet. I bought it, went straight to my bathroom, and washed my hair. The shampoo did not lather, which I expected considering there is no harsh detergents or sodium lauryl sulfate. The conditioner was a very light, thin substance. Definitely not thick. Second, getting good hair is not just a matter of using a good product and expect miracles out of it. My rating is based on the shampoo itself...not the overall style that I got out as a result. That being said, I *love* this shampoo. My hair feels and smells great when I use it. The lack of sulfates really does make a different on overall hair texture. It is especially great with my very hard water. I never thought it would be possible to have my hair feel so good with such hard water. 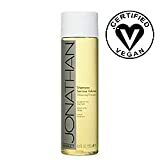 After reading the reviews of Jonathan's products, I wasn't completely sure I would like them, but wanted to try the shampoo, conditioner and Dirt after seeing him demonstrate Dirt on TV. I have very fine, bodyless hair that is short and high- and low-lighted. I usually use Aquage products because they don't weight my hair down and especially like the thickening spraygel for body. Jonathan products smell great. Additionally, I had no problem with the size of the bottles. The quantity is probably the same as any other good product. First the volumizing shampoo: it lathered just fine and I used only a small amount. I could feel the volumizing effect right after rinsing, after which I used the volumizing conditioner. Again, no problem. I decided to forego the thickening spraygel that I usually use in order to give Dirt an honest try. I think I need a little more practice with this product since I am not a hairdresser. I used the smallest amount and my hair was slightly damp. I also need a haircut at the moment. Next time I will put it on completely dry hair and apply it from the bottom going up and underneath. It worked okay, but I need to get used to it. After reading some of the reviews, I was a bit skeptical of actually buying this product. I used it for the first time and it gave my hair great body. My hair is very fine and this shampoo gave it a nice healthy feeling and more volume than my previous shampoos. The one thing that I found out though is that you do not have to use very much as it makes lots of lather! Smells good too! I highly recommend! This product does what it says. I wanted something that would work with both fine and color treated hair, and this is great for that. It does dry my hair out a little, but I just comb the conditioner through my hair in the shower and leave it in a little longer and I'm good to go. I have VERY thin and fine hair, and this adds the body and volume I need. I also use the thickening foam, no need to blow dry to get great volume.